In states where regional parties are dominant, respondents trust their respective regional parties more than national parties. India still trusts Prime Minister Narendra Modi and the BJP government at the Centre, reveals Firstpost The National Trust Survey, conducted by Ipsos. 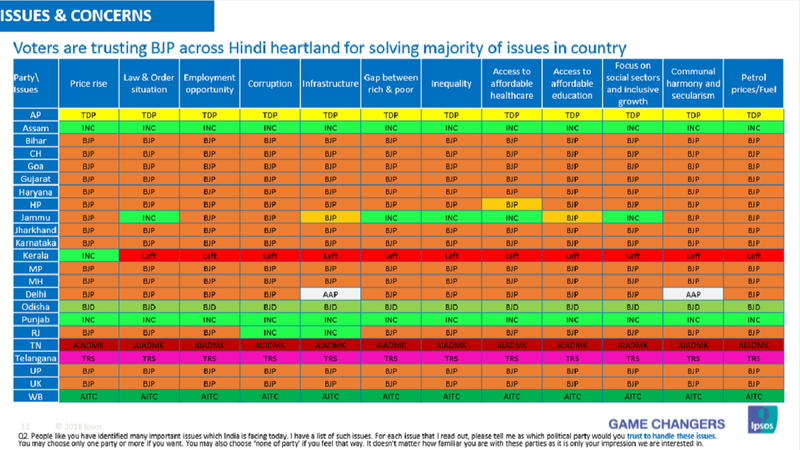 The global market research firm, based in Paris, surveyed around 35,000 people across urban and rural wards covering 320 parliamentary constituencies in 23 states. The objective was to measure the political positioning of the voters and deduce the reasons behind it. 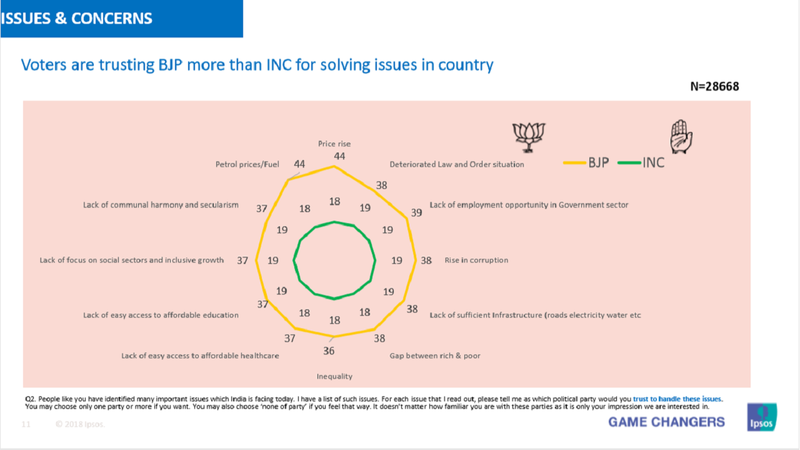 According to the survey, the people of this country trust the BJP more than the Congress to resolve issues such as inflation, petrol prices, infrastructure development, lack of employment opportunities, etc. This phenomenon is more prominent in the Hindi heartlands. In addition, the majority of people have placed their trust in Prime Minister Narendra Modi as compared to Congress President Rahul Gandhi as the leader of the nation, with the exception of Andhra Pradesh, Kerala and Tamil Nadu. However, in states where regional parties are dominant, respondents trust their respective regional parties more than the national parties. As far as the campaign agenda for national parties is concerned, most people think it will revolve around development, except for respondents in Assam and Kerala where the voters are of the view that the agenda will be divisive and revolve caste and community-based issues. As far as the performance of PM Modi is concerned, most people thought that it was good. However, states down South have rated the incumbent prime minister poorly on the performance index. People have identified the Swachh Bharat Abhiyan, the crackdown on black money and the surgical strike as top three actions commissioned by the PM, with more than 50 percent preferring Narendra Modi as their next PM as against Rahul Gandhi, who was the preferred PM candidate for about 27 percent people. Another interesting aspect that the survey has pointed out is that in case of a binary political scenario – the BJP vs a united Opposition, the contest becomes very close, with 58 percent people still voting for the BJP-led NDA and the rest for the Mahagathbandhan. Even if Modi is not the prime ministerial candidate or in a scenario when its allies or its parent, the RSS, withdraw their support from the saffron party. The reason behind a significant proportion of the respondents to lean towards the Mahagathbandhan was the performance of the previous Congress-led governments and the ideology of the parties. Most respondents were also of the opinion that the formation of a formidable united opposition will at least give a tough fight to the BJP, even if it is unable to dent their numbers. The survey has identified the Rafale deal and the Opposition accusing PM Modi of corruption as one of the most significant burning issues. This is followed by the Ram Mandir-Babri Masjid dispute. Besides, after their tri-state victory, 50 percent of respondents felt Congress president Rahul Gandhi is emerging as a serious and mature leader.